Equally arranged teeth are a beauty attribute in all over the world. Metallic braces should help kids and adults to get their teeth corrected. Unfortunately, the metallic wires are visible, not comfortable and make teeth cleaning a complicated procedure. Even years after orthodontic treatment in youth, the teeth can get out of place again for different reasons. Fortunately, since some years a successful alternative method of teeth correction is used. These are invisible aligners which straighten the teeth in short time without pain and optical disadvantages. This technology is often called Invisalign-System because the first company which entered the align technology market was the American company Invisalign. How does the Invisalign dental treatment in Turkey work and how long is the procedure? In our dental clinic in Turkey, we take 3D camera shots from your teeth which will be immediately sent to an Invisalign-laboratory. There the matching invisible aligners are created by software and 3D printers and will be sent back to our clinic. In Maltepe Dental Clinic, you will get the complete Invisalign-system after about one week. The first pair of Invisalign aligners is worn for two weeks at night or day. Even within this period, your teeth will start to move in the desired position. Subsequently, the invisible dental splints are replaced every two weeks by new tracks until your teeth have reached the perfect position. A big advantage is that the Invisalign aligners – if required- are always removable. You can clean them daily with a simple toothbrush. How long the process of teeth straightening takes depends on the malposition of your teeth. In some cases, such as gapped teeth, it’s enough if you wear the invisible aligners for a month. The dentist will deny individually with you the length of treatment. Which abnormal occlusions are suitable to be solved by the Invisalign treatment? 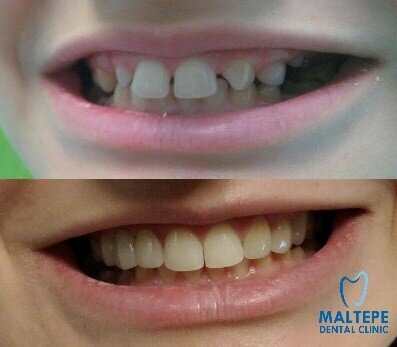 For example, in the following picture you can see a patient of the Maltepe Dental Clinic who wore invisible aligners over a period of time before getting veneers. How do I get cheap and qualitative Invisalign aligners in Turkey? Some malposition of teeth may require a combination of Invisalign and veneers treatment. We inform you about which malposition of your teeth is existent in your case and let you know how the chances of successful correction of your teeth are. We are happy to answer all your questions about Invisalign treatment, veneers or further dental problems and give you information about the treatment costs in our dental clinic in Turkey.